Proprietary Name: Cbdmedic Acne Treatment What is the Proprietary Name? 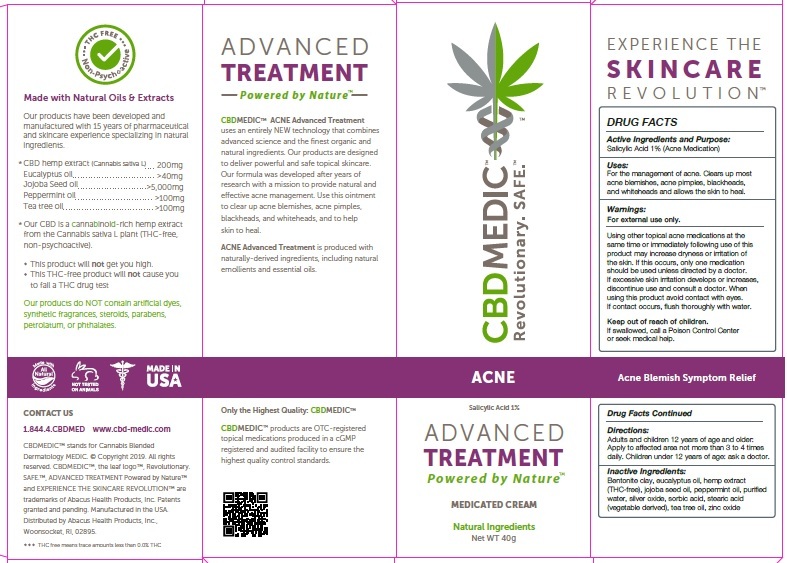 Cbdmedic Acne Treatment with NDC 24909-732 is a a human over the counter drug product labeled by Aidance Skincare & Topical Solutions, Llc. The generic name of Cbdmedic Acne Treatment is salicylic acid. The product's dosage form is ointment and is administered via topical form. For the management of acne. Clears up most acne blemishes, acne pimples, blackheads, and whiteheads and allows the skin to heal. For external use only. Using other topical acne medications at the same time or immediately following use of this product may increase dryness or irritation of the skin. If this occurs, only one medication should be used unless directed by a doctor. If excessive skin irritation develops or increases, discontinue use and consult a doctor. When using this product avoid contact with eyes. If contact occurs, flush thoroughly with water. Adults and children 12 years of age and older: Apply to affected area not more than 3 to 4 times daily. Children under 12 years of age: ask a doctor.